You know when you see something at a thrift store, and at first you think… nah… shaking your head at no one in particular? Then you take a second look during your second lap and you think… hmmmm, maybe… while rubbing your chin and mulling it over, even though the colors are completely wrong. And then you take a third look during your third lap and you think… yes!… and you snap it up… because you have to be the one to make it right. Right? You’ve hard of speek-walking? Well this is thrift-walking. My kind of exercise. lol. 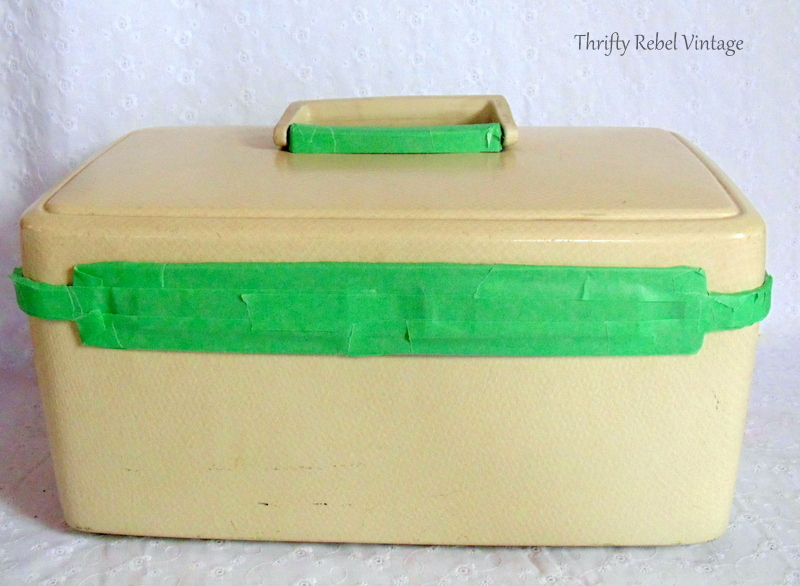 Well that’s the way this happened, and this quick and easy vintage cosmetic case makeover has been a long time coming. 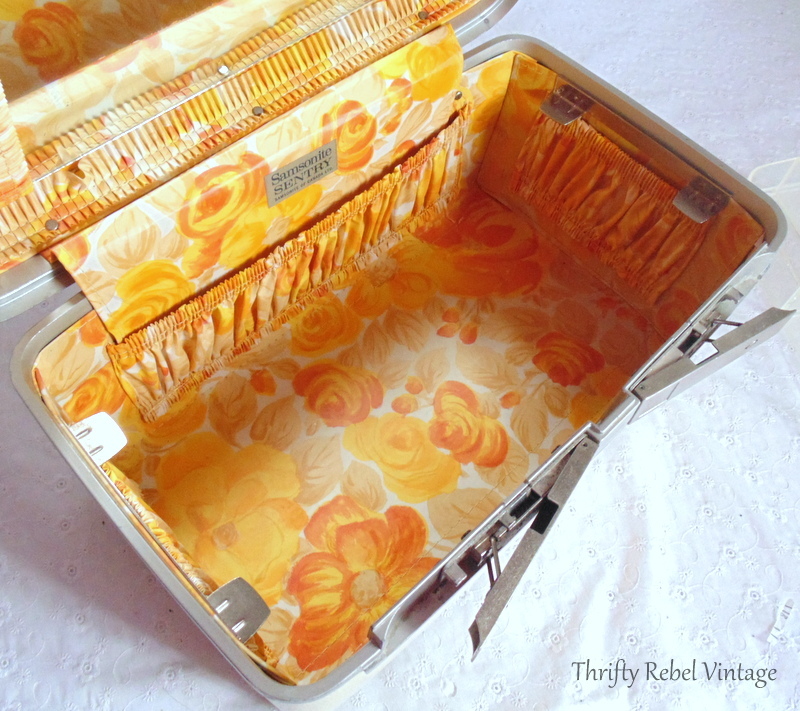 Just in time for the Thrifty Chicks Monthly Project Challenge, which this month is luggage. 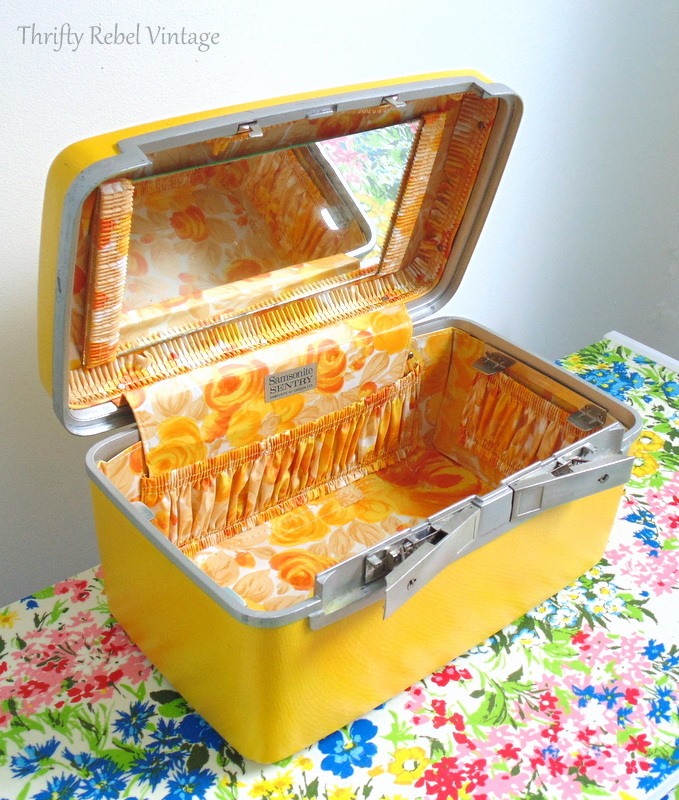 I’m so excited to see what my blogging friends have come up with for this month’s luggage challenge. 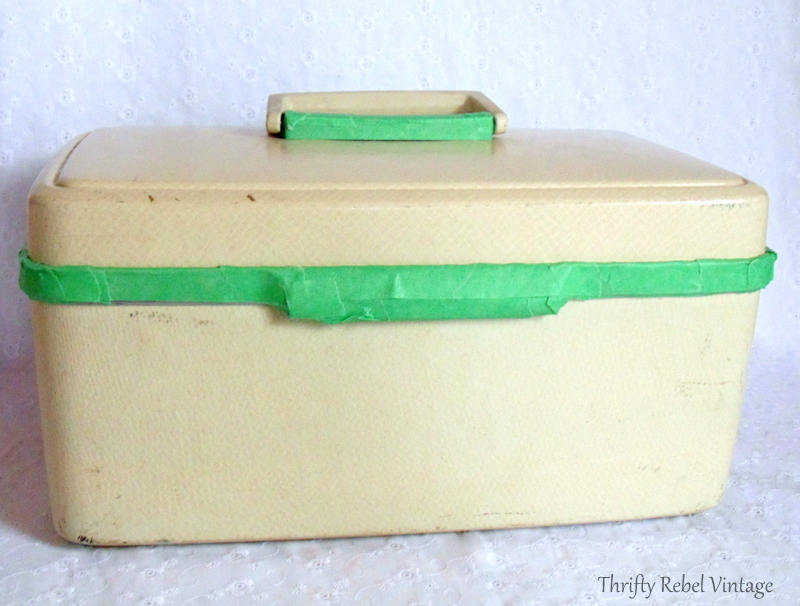 I found this very plain and beige-y boring vintage cosmetic case a while back, and it’s been waiting for its makeover every since. All I needed to give this baby a whole new look was some painter’s tape and spray paint. When I saw it at the thrift store I almost passed it twice because I’m so not a beige kinda girl. Even though I was pretty sure it was beige on the inside too, I decided to open it up and give it a boo on my third time around. 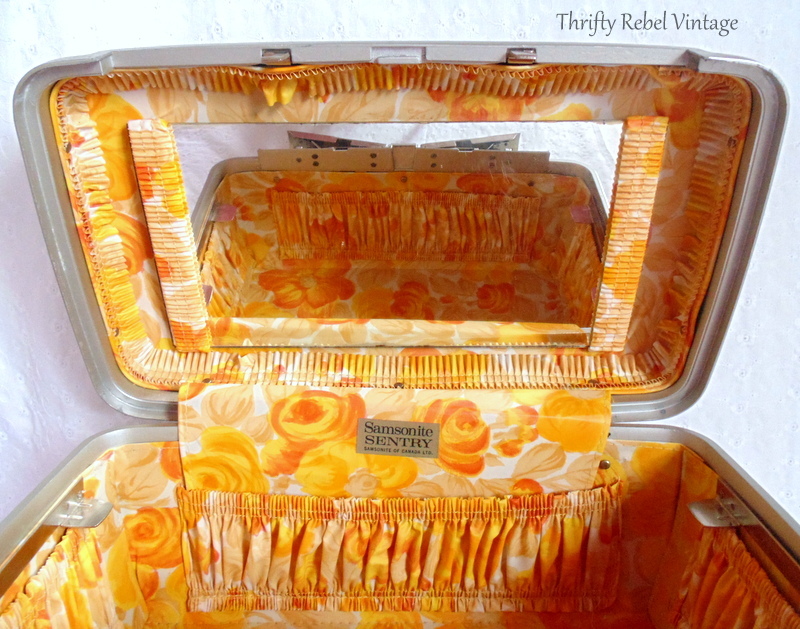 Talk about the 70s in all its orange and yellow floral splendor! Now I’m a girl who loves color, and I do love orange and I do love yellow… but I have to say that I wasn’t totally loving the whole orange and yellow togetherness vibe that was happening here. But the interior was in fantastic condition, and is quite the awesome nod to the fun and funky 70s… so I thought about my options. And after letting it percolate in the back of my brain for like months, it finally occurred to me that the boring beige exterior was its main problem for me. So instead of fighting the whole retro vibe I decided to go with it instead. 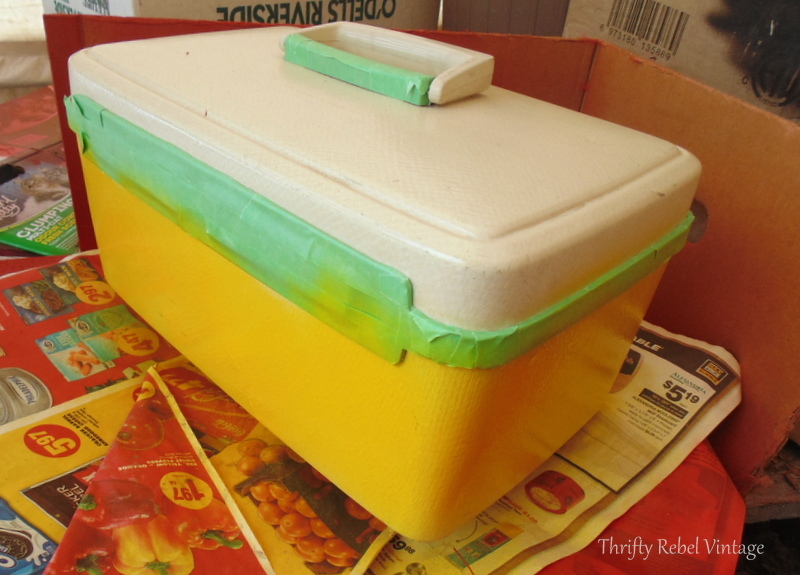 Painter’s tape is a wonder for makeovers like this one. I covered all the silver metal because I wanted to retain its color but also all the little dents and dings. I taped it all the way around, and also the silver part below the handle. 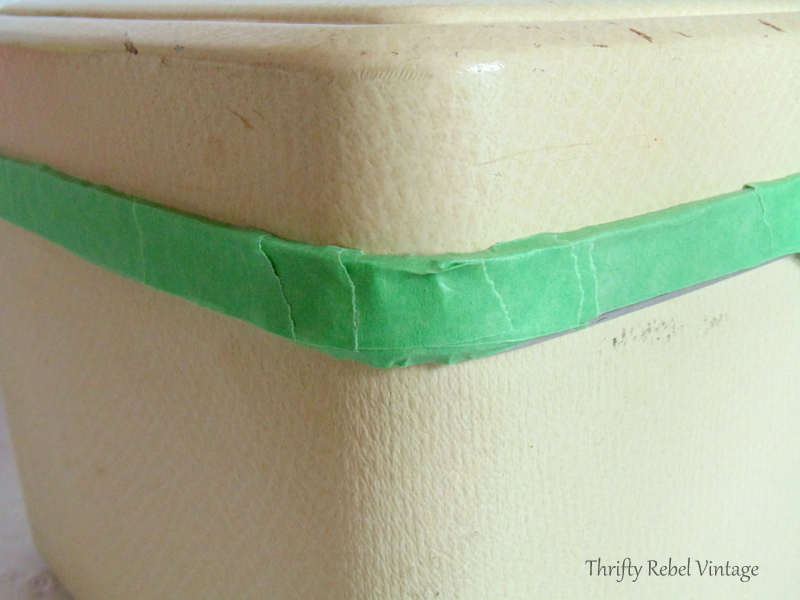 When taping around the corners its best to use small pieces. This makes it much easier to get that little ridge along the top. A little while ago we had a mild spell so I took the case out to our portable garage and spray painted it. Look at the difference between the beige and that fabulous yellow! 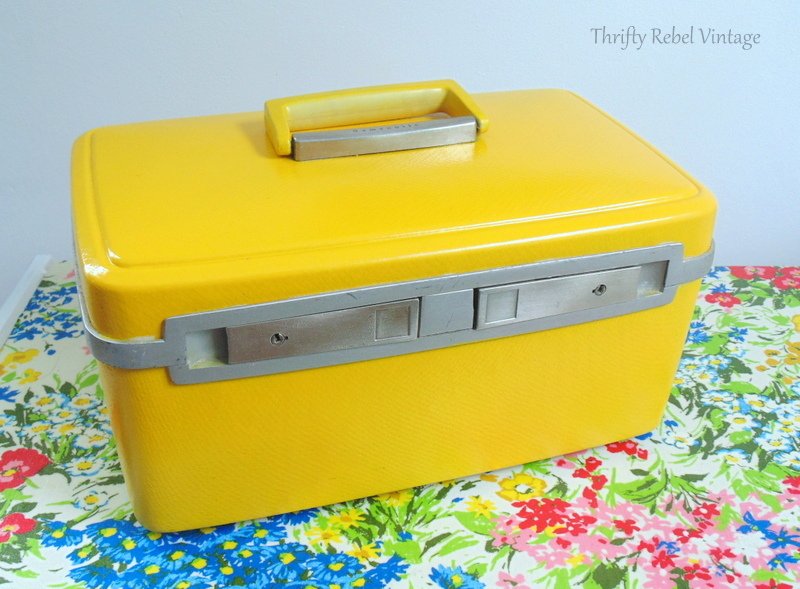 My spray paint color options to tie in the interior floral were this yellow or orange. Orange would be gorgeous too, but I have absolutely no orange in my whole house so I chose to go with the yellow. This makes this case work for me in almost every room. Instead of travelling around the world it can travel around my house. lol. Here’s the interior when the outside was beige. And here it is now with that lovely yellow. 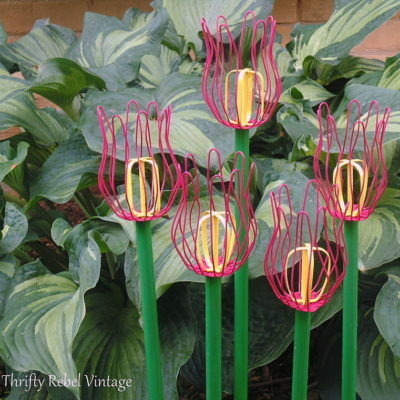 The bright color on the exterior actually tones the floral down a bit because it’s not such a contrast. To me this color combo makes much more sense, and I actually like the floral interior much better now… and the bonus is that I didn’t have to tear out a perfectly good interior. I have to show you the back as well. I gave the case three light coats of paint, and I didn’t worry about any of the dings and dents showing through… and there are a few. They just give it some character. So here’s the boring beige case that I almost passed by. 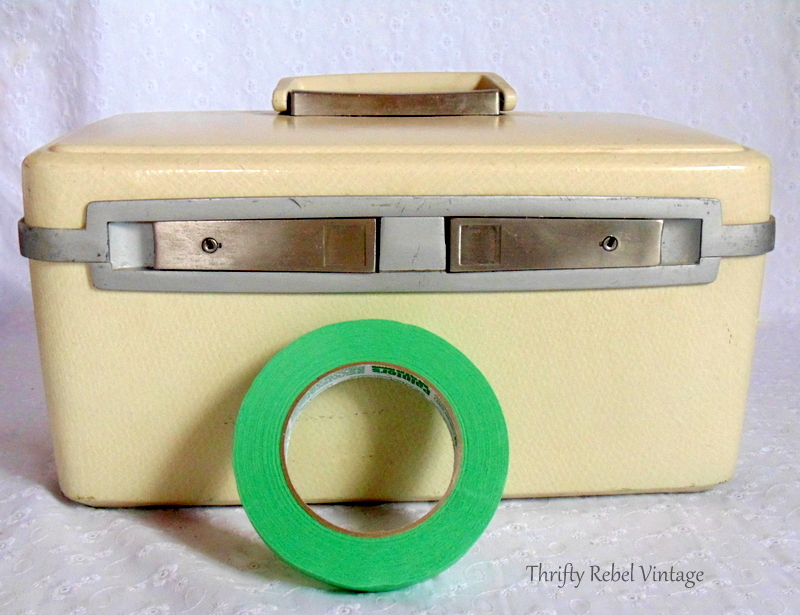 And here’s my quick and easy vintage cosmetic case makeover… just right for me. It’ll be repurposed in my living room office area near my recently decoupaged desk, so you’ll be seeing it again in the future. So the next time you’re doing your laps at the thrift store, take a second or third look at something that maybe didn’t look so good the first time around. You never know, you just might see something that you can easily make right for yourself. 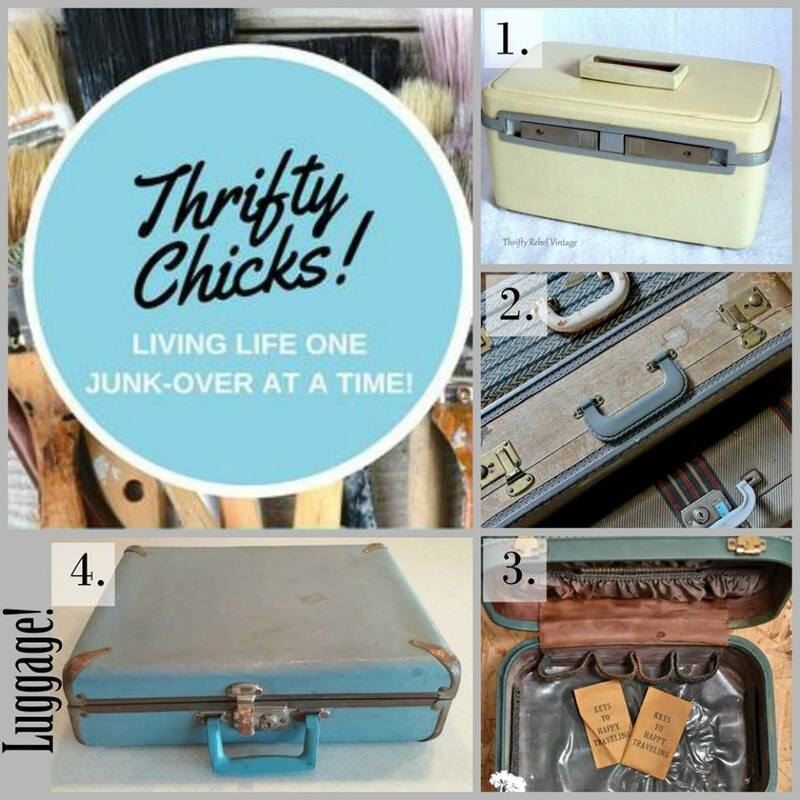 Now be sure to check out what my friends did with their luggage projects. 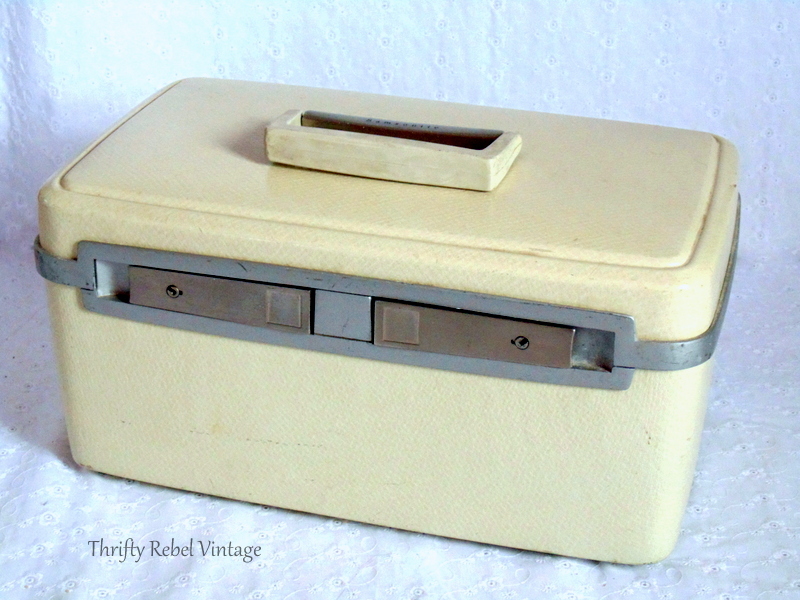 1.Thrifty Rebel Vintage – That’s mine. I love this tuula! Such a simple update yet it makes such a big impact! Thanks very much Tania! I’m always amazed at what a little spray paint can do. When I saw the perfect condition of that funky fabric I said out loud to my computer monitor, “don’t do it Tuula”. I am so relieved to see you kept and worked “with” it. LOVE LOVE LOVE the refresh you gave the cosmetic case!!! The pretty yellow makes it sing like the Spring birds. 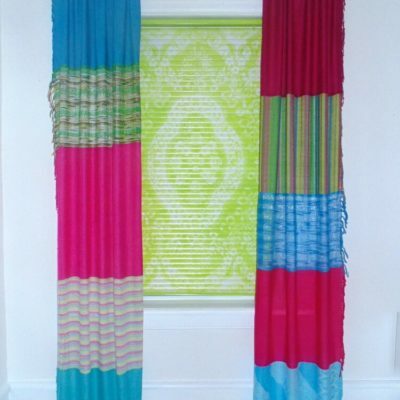 I can see some beautiful Spring|Summer vignettes in your home using this case. Thanks so much Marie! You and I are on the same wavelength with this one. I do have a few vignette ideas for it. Yesterday I thought the glitch was with my computer. You had comments that talked about the pictures. Glad I got to see how it turned out. I really like what you did. Happy you left the inside it’s so 70ish. Thanks so much Olivia! The pics were showing fine in the morning so some readers got to see them before the glitch happened. I hope it didn’t cause you too much worry about your computer. There are only 2 colors that I don’t like…yellow and orange. HOWEVER, I love this soooo much! It is absolutely beautiful. Unfortunately it would not have come home with me. Glad it found a good home with you! Thanks Granny! Sometimes the best way to work with colors we’re not to fond of is to neutralize them by working with them instead of against them. Sounds strange, but it works. This looks fabulous. 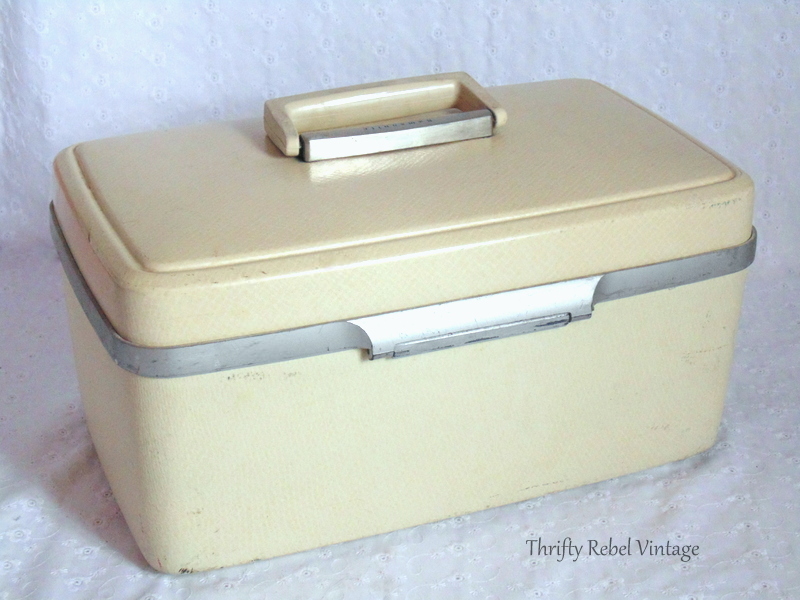 The beige was so bland that it made the lining look awful. But after you painted the case it looks like this was meant to be. 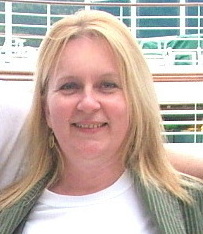 Thanks very much Debra! It’s definitely happier now, and so am I.
I’m impressed! BTW, glad the computer problems got fixed. 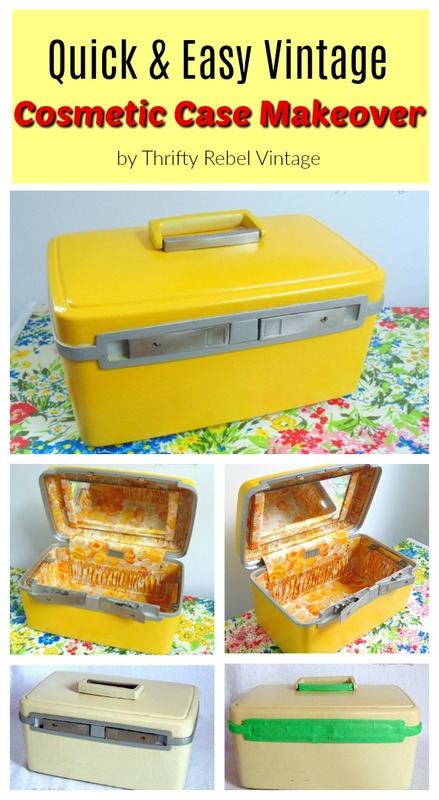 Back to the case…I’ve never seen an interior like that…boy is it awesome, and probably would have sold as is, but I do LOVE the yellow paint! What a transformation! It looks like it came that way. What kind of spray paint did you use? I have a small suitcase here I’ve tried to sell. Nothing wrong with it, but it won’t sell. It’s dark gray…kinda boring looking. I’ve been thinking of repainting it. You’ve inspired me. Thanks Florence! I know what you mean about the interior. Most of the ones I’ve seen in the past have been solid colors. So the fact that it was in perfect shape made me want to preserve it, but the beige wasn’t doing it any justice whatsoever. I used Krylon Fusion. I think you can pretty much spray paint anything with it as long as its clean. I love this makeover! That interior is just fabulous and would be so cute sitting open to show it off. I actually bought a travel case with an awful exterior because I heard you can paint over them. Well, it is still sitting there waiting for me. I am now inspired! I was going to brush it on but I might try spray painting instead. Thanks AnnMarie! If I can spray paint something rather than brush painting I’ll do that every time. It’s so much easier. This case is beautiful. I’m so glad you didn’t destroy that interior but added the yellow! I just love it and in fact this is the one I’ll never forget. I have an ugly blue case with an ugly blue interior, probably from the 60’s. I have no idea what to do with it unless I paint it and then stencil it. Sounds boring compared to yours. Thanks. My first reaction when I saw the pic of the open case, finished , was…Aahhhh. perfect! My mom would have loved it! I tbink I probably wore something with a print like that wben i was a teen! Thanks so much Jennie! I like it so much better now too, and it wouldn’t surprise me if I wore something similar myself. That interior is fantastic I would of bought for it that alone! 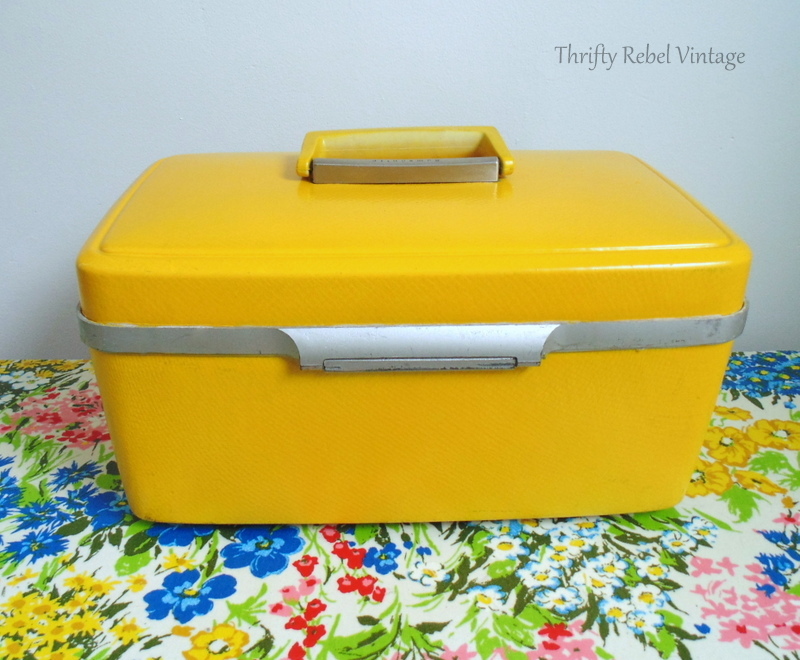 Changing that boring beige out for the sunny yellow is exactly what the rehab junk doctor ordered. I was surprised how easy you can transform these cases with paint, I painted a small case black (it’s a Halloween thing) and the paint has held up extremely well. 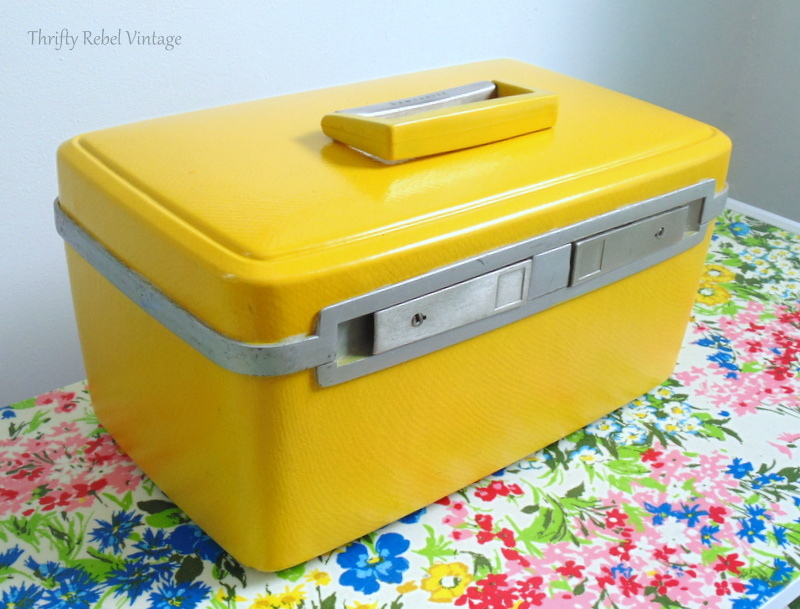 Are you only going to use it for vignettes or do you store stuff in your vintage containers/suitcases, too? I am beginning to use some stuff for storage and I like the idea! Probably more for storage than vignettes Kathy. I love that this case can be left out because it’s nice to look at. It’s both practical and pretty, and for me that’s always a good combo. I love the yellow color, it’s perfect! What kind of paint did you use? Did you need to prime it first? Thanks Tracey! I used a Krylon paint and primer spray paint combo so I didn’t have to prime first, which is a huge time saver. I just gave the case a good cleaning before painting. 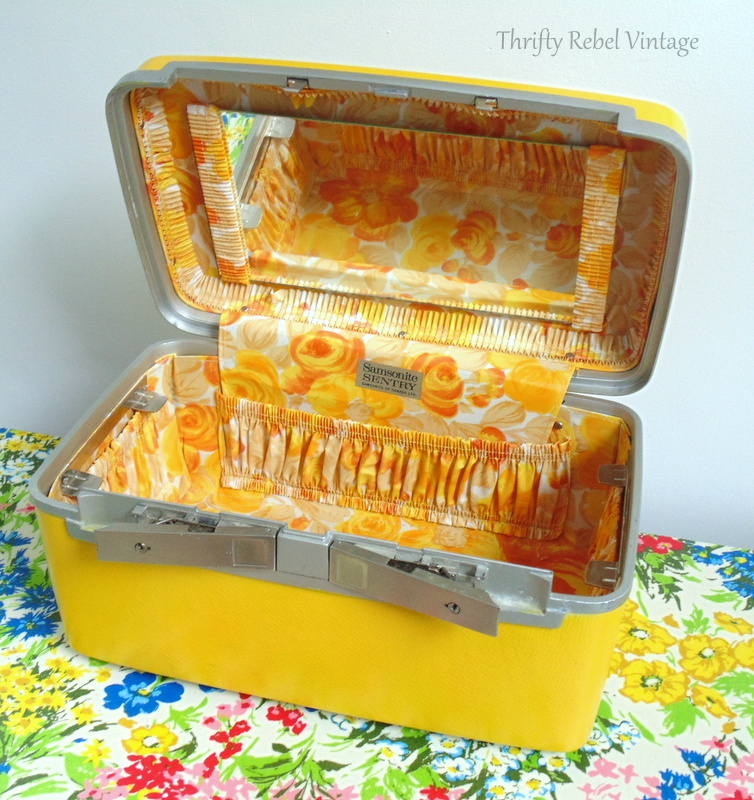 nice work on the yellow vintage case! OK…..You got me with this one. 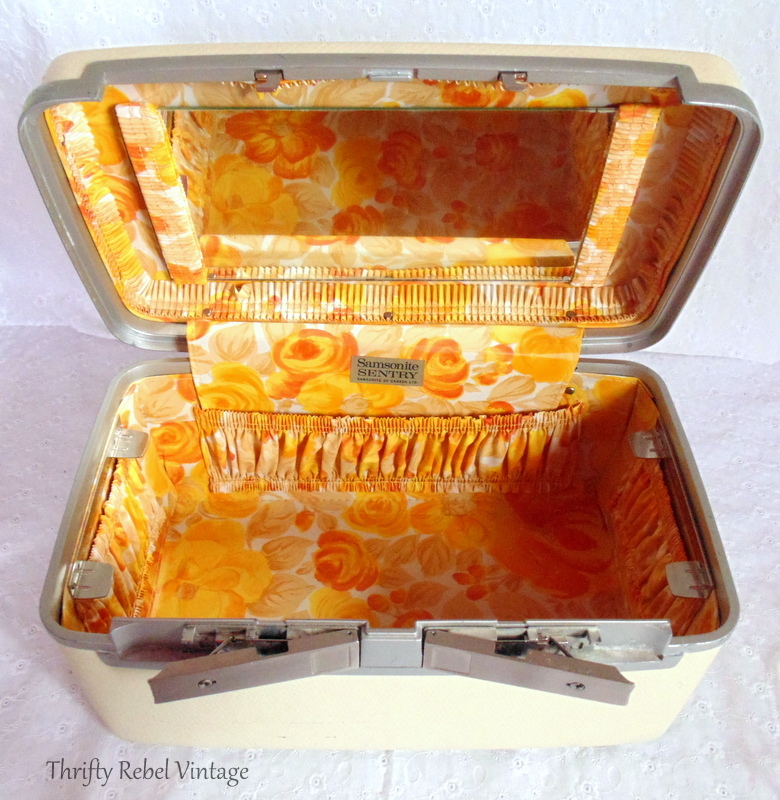 Off to look for old cosmetic cases to use for my sewing basket 😉 Thanks for the inspiration!